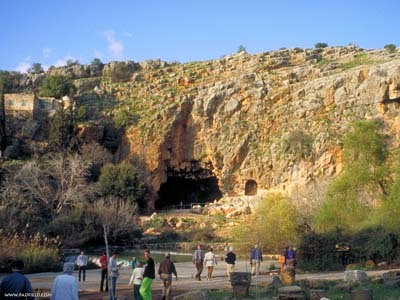 Caesarea Philippi today stands out from the tourist guides as one of the sources of the River Jordan, a tranquil spot whose solitude is broken only by the busloads of tourists who descend upon it daily, and by the rock rabbits who have made their homes amongst the caves there. That it was once a bustling city seems far from anybody’s mind. Today, as in antiquity, the area is known as Banyas or Paneum, its name derived from Pan, the nature god whose magnanimity was evident in the Jordan. Here, at the base of a mountain whose top, Josephus averred, “is lost in the clouds”, lies a cavern within which “a sheer precipice descends to a cavity filled with still water; no plummet has ever reached the bottom no matter how long the cord. From the roots of the cavern… well up the springs.” Today, they do so at a rate of 200 cubic feet per second, from a crack below the cave. It was the scene of a mighty, and decisive battle at the close of the Fifth Syrian War – the Seleucids defeated the Ptolemies here in 200 BC, and it was here that the conquerors established the capital of the predominantly non-Hebrew region of Panias. And on through the eras of the Macabees and Hasmonaeans, Paneum remained a Hellenic thorn in the Jewish side. 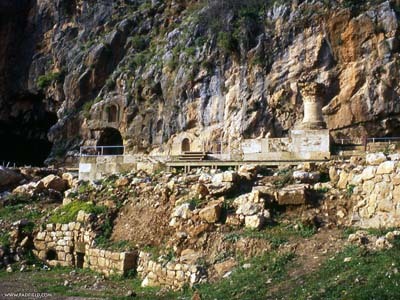 In 20 BC Paneum, a small, but administratively important city, was granted to King Herod by the Emperor Augustus. In gratitude, Herod erected a white marble shrine, dedicated to his patron. But it was Herod’s son, Herod Philip, who commenced raising the city far above its accepted station, renaming it Caesarea in honor of the Emperor, then adding his own name – Philippi – so as to distinguish it from other cities of that name. It was here that Philip established both his capital and his mint, the coinage struck here being intended for circulation throughout Trachonitis (the area which included the city), Batanaea, Gaulanatis and Auranitis. A bronze coin in the British Museum collection, struck in Year 34, refers to Philip as the founder of the city. Philip acceded to the governorship of this most northerly part of his father’s kingdom, with its annual revenue of 100 Talents, in 4 BC. No coinage was struck before Year 5 (1 CE), however; a unique coin – previously in the Reifenberg collection – thus dated bears Philip’s name around the bust of Augustus. The Emperor’s own name and title have been relegated to the coin’s reverse, where they encircle the customary Temple of Pan. Unlike his brothers, Archelaus and Antipas, Philip struck a very regular coinage, averaging between seven and nine grams in weight. But it had a very limited field of circulation. It is rare to discover Philip’s coinage beyond the borders of his kingdom, and those which did stray – the solitary specimen unearthed during the excavations at Curium in Cyprus, for instance – were most likely transported there by travelers or soldiers. Philip struck coinage from Caesarea Philippi during nine of the 38 years he reigned; years 5, 9, 12, 16, 19, 30, 33, 34 and 37. Of these issues, the most interesting, and puzzling, is the output of Year 19 (15/16 CE). The entire striking was found to be slightly underweight, and was countermarked with a device which included Philip’s initial. Year 19 also marked Philip’s first issue under the reign of Tiberius, and it has been suggested that the countermarking reasserted Philip’s authority to continue issuing under the new regime. Philip died in 34 CE; he was succeeded three years later by Agrippa I, the grandson of Herod the Great and a favorite of the newly appointed Emperor Gaius Caligula. Arriving in his new kingdom the following year, Agrippa immediately adopted Caesarea Philippi as his capital, and a coin issue dated Year 2 swiftly followed. Over the next four years, Agrippa was to accede to the thrones of the other Judaean kingdoms, reuniting the province under one ruler for the first time since the death of his grandfather. Following this, he abandoned Caesarea Philippi as his capital, moving the administrative and minting establishments to Jerusalem and to the coastal city of Caesarea Maritime. Those of his coins struck in Years 2, 5 and 6 (38-43 CE) were struck at Philippi, and depict, on his inaugural issues, Agrippa’s infant son on horseback; on later types a figure standing within a quadriga. The debut issue, incidentally, is also of interest in that for the first time a Judaean ruler included his own portrait on a coin. Thereafter, Caligula (and for the final issue, Claudius) were featured. Agrippa II was 17 when his father died; far too young, in the opinion of Claudius, to be granted so potentially unruly a territory as Judaea. The procurator Cuspius Fadus was thus granted custody over the region, and not for another decade was Agrippa to at last begin receiving the territory that was his. The district which included Philippi passed to him in 53 CE. The city was greatly adorned by Agrippa II, particularly following the accession of Nero in 54 CE. Indeed, in 61 CE Agrippa refounded the city in Nero’s honor, naming it Caesarea Neronius and commissioning a newly established mint to produce a sequence of commemorative coins, struck in three denominations, all of the same type and inscription, were struck. Agrippa lived through the reigns of ten Emperors, but struck coinage in the names of only four: Nero, Vespasian, Titus and Domitian. His own bust also appears on several issues. Inscriptions for the most part were in Greek, but a small group of coins from the later period were inscribed either in Latin or, occasionally, in Latin and Greek. An interesting characteristic of Agrippa’s coinage is his use of four different systems of dating: commencing 44/45 CE and continuing, 48/49 CE (in reference to his being granted the first portion of his Judaean inheritance); 53/54 CE (marking the commencement of the Flavian dynasty), and 60/61 CE. Of these, the first appears on coinage issued during the first four years of the Flavians; the second is found on Agrippa’s initial issues, struck under Claudius and Nero; the third (occasionally double-dated with the second) during the later reign of Nero and the fourth for the remainder of the reign. Just as Jerusalem was of vital importance to the Jews, so Caesarea Neronius was to remain the center of Roman influence in Judaea. During the Jewish War, Agrippa invited Vespasian and his army to the city where he provided – for three weeks – state banquets and entertainment, while Vespasian himself spent much time sacrificing to the gods, that they might grant a successful conclusion to the conflict. Later, following the fall of Jerusalem, Titus took over the city to stage the executions of Jewish captives. Coin issues from this period invariably depict Nike, symbolizing Rome’s suppression of the revolt. A more overt reference to the conflict is found on a coin issued in the name of Domitian, in the field of which lies a six pointed star. With Judaea falling under full Roman rule, the colorful coinage of the First Century now disappeared. So did many of references to the Imperial favor which past rulers had attempted to curry; Philippi/Neronius reverted to its earlier name, Panias (Caesarea remained appended) and it was under this name that a copper supplement to the Imperial coinage continued to be struck sporadically until the Third Century. The earliest of these new provincial types was issued under Marcus Aurelius, and depicts Zeus. It is dated Year 172 of a local era commencing in 3 BC. Close to half a century later, in 217 CE, an issue was made honoring the statue of Pan which stood in one of the public squares. And four years later, following the elevation of Elagabulus by the Syrian troops, similar coins were issued by both the Emperor and his grandmother, Julia Maesa. final decline of Caesarea Panias as an administrative center. However, it remained a center of population throughout the Roman era. Eusebius refers to it when discussing the reign of the apostate Julian; in a fountain in one of the public squares there stood a group of bronze statues, interpreted as representing Jesus healing the woman with the issue of blood – local inhabitants could even point out the woman’s home to visitors. Eusebius was only one of many who believed the statue to pre-date the Empire’s adoption of Christianity by several hundred years (the same image can be seen on the coins of Hadrian, where it represents the Emperor restoring rights to the provinces). But pagan vandals nevertheless defaced it. Caesarea Panias finally died early in the Byzantine period, when the city was leveled by a tremendous earthquake. It was not to be repopulated until the 12th Century, and even then only fleetingly. And even the village of some 200 or so which grew up during this century now stands deserted, a gaunt, shell-pocked reminder of the Arab-Israeli war of 1967. Little remains of the village; even less of earlier glories. The cave of Pan remains the centerpiece of the site, but only the niches carved into the face of the rock to receive statues during the Graeco-Roman period remain of man’s adornments to the shrine. Otherwise, nothing more than isolated columns and blocks still stand. The city has returned to nature, and to Pan.